Implanting metal plate in cervical spine. 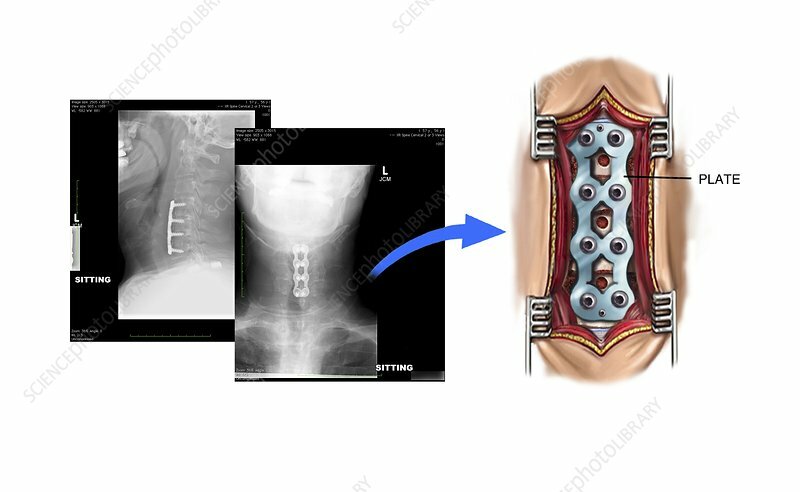 Labelled artwork (right) of a frontal view of the closing stage of an operation to implant a metal plate on the lower part of the cervical spine. Retractors are in place to hold back the overlying tissues. At left are post-surgical X-rays showing the metal plate in place on the spine. The lateral (side) view at left shows the screws used to fix the metal plate to the vertebrae. The X-ray at centre shows a frontal view corresponding to the artwork. This plate has been screwed to four vertebrae, with two screws at each level. This sort of operation is carried out to treat broken vertebrae, usually fractured through traumatic injury.